Your apartment benefits from a southerly aspect so you have the sun all day long. 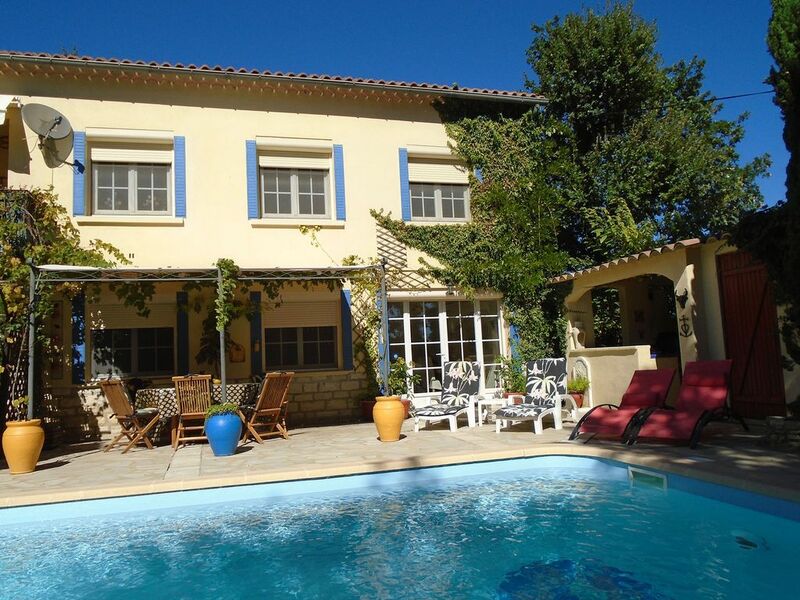 It's within walking distance of shops, bars and restaurants and has an hourly direct bus service to Avignon. Nestling amoungst the vineyards of the southern Cotes du Rhone, the independent ground floor accommodation is particularly suitable for wine buffs as you are surrounded by the major wineries of Laudun, Lirac, Tavel and Chateauneuf du Pape. The large floodlit pool is great for evening bathing, its bordered by conifers for privacy and equipped with a family sized solar shower. The pool is open from April to October making La Soleillade an ideal location for your Spring or Autumn break. There's a poolside Summer Kitchen equipped with facilities for making your own paella, a plancha grill, a fridge freezer for cool poolside drinks and an inbuilt charcoal barbecue. Meals can be enjoyed on the patio and the pool is surrounded by loungers for sun worshipers or, if you prefer, there is a grape covered pergola where you can cool off and snooze the afternoon away in peace, or just float up and down the pool in the large inflatable armchair. Your accommodation comprises a comfortable living room with WiFi connection and french doors to the south facing patio area. The living room has two large sofas, one of which converts to a comfortable double bed. There's a TV with connection to British broadcasts, a DVD player, a CD player/radio, an extensive collection of books and movies and a dining area seating six for cooler evenings. The apartment sleeps 6 plus baby. There is one double bedroom and one twin bedroom The living room has two large sofas, one of which converts to a comfortable double bed. There is also a boxroom with cot for baby up to two years. You have a fully equipped kitchen decorated in the Provencal style with local colourful pottery and a shower room with a large walk in Italian shower and a selection of local olive based soaps. Children are very welcome, the spacious garden is equipped with a set of swings and the pool has a selection of age related inflatable toys and swimming aids. You have everything necessary for traveling with baby including a cot, playpen, high chair, bath, potty, plastic bowls, sippy cups and a changing mat. There are plenty of places to keep the children amused include a visit to the Haribo bonbon museum at Uzes, the grotto of Salamander floodlit caves or the crocodile farm at Pierrelatte. You can hire canoes to discover the beautiful valley of the river Ceze, or go horseback riding amoungst the sunflowers and lavender fields. If you have limited mobility, the apartment has easy access and a large spacious walk in shower. Your garden is planted with apricot, peach, fig and almond trees and you can help yourself to the grapes which cover the pergola area. The property is approached by a long gated driveway and you can enjoy a game of boules on your own petanque court. We have both ladies and gents bikes available free of charge to allow you to explore the surrounding area. Avignon is 20 mins away with its arts festival in July. You have three of the most beautiful villages in France within a 20 km radius and you can discover the World Heritage Sites of Orange and the Pont du Gard or visit Arles and follow in the footsteps of Van Gogh or just wander the cobbled streets and enjoy the weekly Provencal market in the Duchy of Uzes. La Soleillade offers you a tranquil base to return to after a day exploring this historic region and no matter what time of year you choose to visit, everyone is welcome here. I'm Scottish by birth and French by nationality. My husband and I have spent many years visiting and living in France and decided on retirement to move to 'the Sud' for a more leisurely style of life. We live on the first floor and have our own entrance. We are on hand, if required, otherwise you will not be disturbed. I love meeting people, introducing them to this historic region and sharing all my tips to make their holiday truly memorable. We bought La Soleillade because of its quiet location, southerly aspect and the warm welcome of our French neighbours who have become life long friends. We have stayed in all the departments of the Languedoc but chose the department of Gard because its the greenest and the most easterly with direct connections to north south autoroutes. La Soleillade is situated in the most southerly corner of the region known as the Gard Provencal. The property is well situated for transport connections and you can visit all the important towns of the region very easily and have a beautiful peaceful base to return to after a days sightseeing. I love to take the train to Aix en Provence or Marseille for a days shopping and Avignon is only a 20 mins drive or you can take the local bus and spend an hour touring all the surrounding beautiful villages en route. By staying here you can experience life in a small undiscovered southern French town, its a bit like stepping back to life in the 1950s with real church bells chiming the hour and peaceful Sundays when you can wander into the village for fresh baguettes and visit the local morning market. toilet, shower, Toilet, Mexican pottery handbasin and large Italian shower. Bathroom with large walk-in Italian shower with twin heads, vanity basin, toilet and heated towel rail. The bathroom is equipped with towels and a hairdryer. Electric oil filled radiators in all rooms. Electric towel rail with fan in shower room. Bed linen, tablecloths and kitchen dishtowels. Located in garage to rear of property. Washing powder and fabric conditioner provided. Located in garage to rear of property. Property is equipped with a drying rack and there is also a clothes line set up in the garden to dry clothes in the open air. Garage with facilities for charging and storing electric bicycles. Set of towels per person. Please bring your own beach towels. Two spacious sofas, one of which converts to a double sofa bed. 2 Fridge/Freezers, one situated in summer kitchen area. Fridge is stocked with basic requirements. Eggs, butter, milk, assorted salads, fruit drinks and a pack of bottled water. We also supply a welcome pack of tea, coffee, sugar, jam and croissants. Large assortment of dishes for every occasion, including plastic bowls, plates, sippy cups and cutlery for young children. Fully equipped with kitchen utensils. Dining area with seating for 6 persons and extendable table. Selection of movies in French and English. Mature Mediterranean garden with olive, apricot, peach and fig trees. The pergola area is covered with grapes.The driveway contains a petanque court for playing boules. We have two ladies and one gents all terrain bikes located in garage which you are free to use to explore the surrounding vineyards. Patio with covered pergola area containing dining table to seat 6 persons plus baby high chair. May be suitable for persons with limited mobility. The apartment is all on one level and the shower is walk in with plenty room to sit if required. Large graduated pool of 53 cubic m. which can be floodlit for evening bathing and is equipped with inflatable loungers and large selection of pool toys. There is a family sized poolside solar shower. There is the opportunity to enjoy many walks in the surrounding areas, including a climb up to the Camp de Cesar, with its Gallo/Roman remains and superb view of the valley of the Rhône. You can explore the Gorges of the Ardêche to the north by canoe or just cycle around amongst the vineyards and sunflower fields. We have a category one fishing river flowing through the village. Permits can be obtained at the local tabac and there is the opportunity to catch both trout and zander. We are also only a stones throw away from the river Ceze for chubb, carp and barbel and of course the possibility of catfish in the mighty Rhone. A lovely well presented and managed apartment. Conveniently situated as a base to visit beautiful and interesting places in the Provence. The apartment was spotlessly clean and well equipped and the host, Linda is a delightful Scottish lady with good knowledge of the area and on hand , but discreet, which is a definite plus. I would recommend La Soleillade as a superb place to stay. Thank you Patricia. It was a real pleasure to meet you and to share my love of this beautiful region with you both. The apartment is lovely - furnished and decorated to a high standard, spotlessly clean. The pool is stunning, very clean with plenty of chairs and loungers. The British TV was a bonus! Linda is a fantastic and warm host - helping you to make the most of your holiday. She suggested a few trips (for a family with 2 children) and helped with directions. The location was fantastic - loads of things to do nearby and the scenery is beautiful. We went in mid to late October and had a beautifully sunny week. I would highly recommend this apartment to other travellers and would love to return! ...and we would love you all to return, it was a real pleasure having you here. La Soleillade is an ideal location for a late October week/ autumn break as you still have some heat in the sun and the tourist locations are not quite so crowded. A beautiful, clean and relaxing home in Provence. My husband and I spent 4 days in Linda's lovely rental in October. The pool and patio are fabulous-very private with lots of plantings and a covered sitting area. The house is quite large and beautifully decorated-I loved the colorful pottery in the well outfitted kitchen. She stocked the fridge with a light dinner and breakfast needs and was very available with advice and suggestions for dining, directions and having a good time in Provence. It was very convenient to Pont Du Gard, Nimes and Avignon but was in a quiet little town with little traffic. We loved it and would definitely return. Thank you for your kind comments, it was a real pleasure having you here for your short autumn break. Provence is lovely at this time of year and the sights are not nearly so crowded. We would love to see you both again. Great property and very helpful hosts. The property is great and the pool and grounds are beautiful! We greatly appreciated Linda stocking the refrigerator with food for dinner and breakfast after our long flights and drive. Linda also found a delightful upscale restaurant that had a vegetarian option for a birthday celebration. She even made the reservation for us as my French language skills are rusty. The kitchen has everything you need to cook all your meals and the accommodations are tasteful and comfortable. Thank you so much Karen and Oskar. One of the advantages of living on the premises is that I'm always available to facilitate your stay and make your holiday as pleasurable as possible. Hope to see you both again if you return to Provence. Very cosy with all the comforts of home. The accommodation lacked for nothing. Location was great for Avignon and Uzes. Linda was so welcoming and attentive and a delightful host. Thank you so much Paul. It was a joy having you here, I hope you enjoyed the rest of your holiday in La Belle France and I would be delighted to see you both again if ever you come back to Provence. A Lovely Experience....the Apartment is even better than all the photos indicate. We were so pleased with our stay at Linda's and John's apartment. They have put so much thought and care into everything. Everything about the accommodation says...we welcome you here as our guests and we want you to enjoy your visit. It was extremely clean and well-stocked and such a pleasant place to relax and enjoy the area. I loved the fact that Linda likes to collect pottery....it was so much fun to use the wide variety of dish ware. We traveled daily to different areas in the Rhone area; the central location made that very easy. And, Linda made reservations for us with local restaurants. We especially loved our dining experience at the Annex....a boat on a segment of the Rhone. Linda even drove us there the day before our reservation to make certain we would not get lost. The kitchen had everything we needed and we enjoyed cooking and staying in for several nights. It was too cool to use the outdoor kitchen during our stay, but using it would have been a treat. And, the refrigerator was stocked with ingredients for our first night's dinner....and so much more. We are so happy we found Linda and John's apartment for our introduction to Provence. It's a wonderful place to stay! Thank you so much Cheri, it was a real pleasure having you both stay and share in your discovery of the beautiful Rhone valley. I know I really need therapy where my collection of local pottery is concerned but it is so nice to see other people enjoying the collection. I was more than happy to help you get to know the area and if you ever return to Provence, we would be more than happy to welcome you both home to La Soleillade. Located within The Golden Triangle of Provence, La Soleillade is an ideal base for exploring all the important sites of the area. The apartment is an great base for wine buffs, who will enjoy visiting Chateauneuf du Pape, Lirac, Tavel and of course Laudun, which is one of the 'Cotes du Rhone Villages'. We are surrounded by vineyards and there are many winery tours and Cave Cooperatives to visit 'pour une petite degustation'. Art lovers should not miss the Museum Albert Andre in Bagnols sur Ceze. Andre moved to Laudun after his demobilization from World War One and became curator of the art museum of Bagnols, where he remained until his death. He was a best friend of Renoir who essentially served as his teacher and mentor. The museum is located on the second floor of the city hall and contains works by Rodin, Renoir, Matisse, Monet, Picasso, Gauguin, etc. and admission is free! There are plenty of places to keep the children amused include a visit to the Haribo bonbon museum or the crocodile farm at Pierrelatte. You can hire canoes and bicycles to discover the beautiful valley of the river Ceze, or go horseback riding amongst the sunflowers and lavender fields. Laudun is famous for its Gallo/Roman remains. There is a beautiful walk up to the 18 hectare site of Caesar's camp through a forest of Mediterranean oaks and pines and with magnificent views over the southern Rhone valley. The Camp de Cesar is also a renowned mountain biking trail. The village hosts a Sunday morning Provencal market where you can buy all the fresh local produce. To celebrate Bastille Day on the 14 July, the village is en fete. We have a feria in the main street which includes the running of the bulls, skillfully controlled by the cowboys of the Camargue, with the blessing of the beautiful white horses taking place first outside the church. There are many bodegas opened up by locals where you can enjoy the local vino and tapas and the whole atmosphere is enhanced by a jazz band. These celebrations are not just confined to July as Laudun loves a feria! Avignon is 20 mins away with its arts festival in July. We have three of the most beautiful villages in France within a 20 km radius and you can discover the World Heritage Sites of Orange and the Pont du Gard or visit Arles and follow in the footsteps of Van Gogh or just wander the cobbled streets and enjoy the weekly Provencal market in the Duchy of Uzes.